This is the very basic pattern that I used to make my tea cosy. I decorated it with flowers but you can add lots of other embellishments to personalise it. This pattern uses chain stitches, trebles (US DC) and slip stitches. 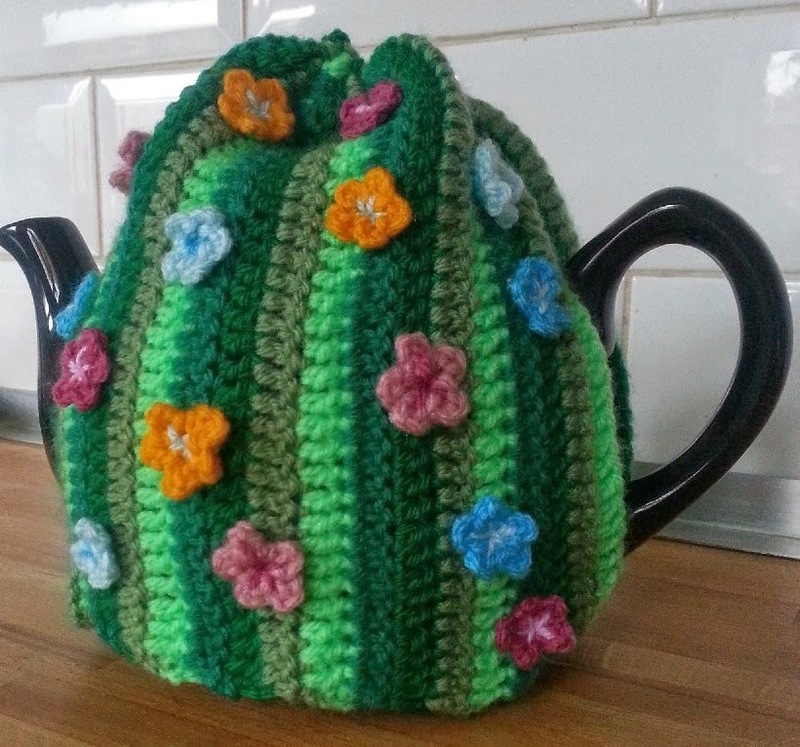 The tea cosy is made flat and then sewn together at the end. Your foundation row will be the height of the finished tea cosy so adjust the length by measuring it against your tea pot - so that it will fit nicely - by holding the base of your foundation chain at the bottom of the teapot and the top of the chain row on the top of the lid of the teapot - add a few more stitches or undo a few if needed. To change colour at the end of each row fasten off by joining the new colour in the loop of the last stitch. Crochet over the ends of the work as you go to help with sewing in later. I used four different shades of green for the body of my tea cosy and repeated the stripe sequence throughout, however you can use any colours you wish and make the stripes completely random or however you like. Row 1: 1 treble in third chain from the hook then crochet 1 treble in each chain along (35 stitches) Fasten off. Row 2 - 20: Join a new colour, chain 3, turn your work and crochet 1 treble in each stitch along (35 stitches in each row). Repeat this 19 times, so you have 20 rows in total. 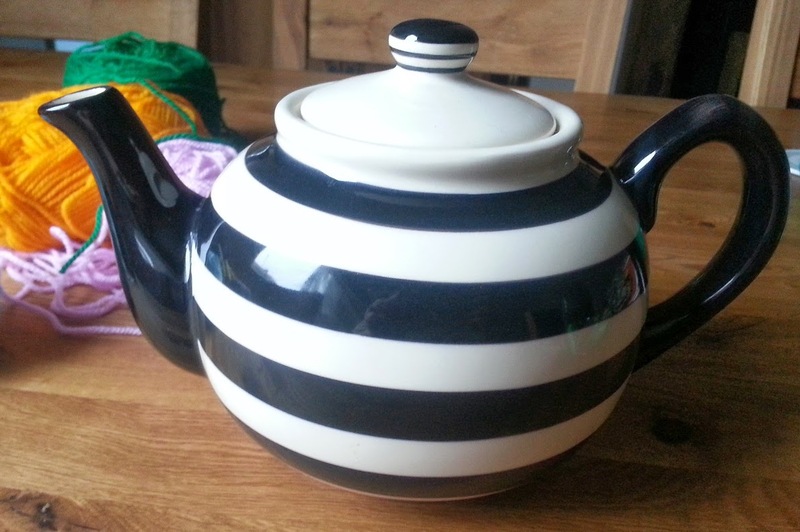 Hold the tea cosy vertically against your teapot, it should now fit snugly from the handle to the spout. If it needs to be a bit bigger or smaller, add more rows or take some back before beginning the spout gap next. Row 21: Join a new colour, chain 3, turn, crochet 1 treble in the next 4 stitches. Fasten off. Skip the next 10 stitches and rejoin the same yarn that you have just fastened off, chain 3 and then 1 treble in the next 19 stitches. Fasten off. Row 22: Join a new colour, chain 3, turn your work and crochet 1 treble in the next 19 stitches. Fasten off. Rejoin your yarn in the next treble from the previous row, (so you are leaving a gap the same width as on the previous row and continuing this stripe down to the bottom) Chain 3 and then 1 treble in the next 4 stitches. Fasten off. Row 23: Join a new colour, chain 3, turn and crochet 1 treble in each of the next 4 stitches. Chain 10 (so you are making a row of chains over the spout gap) and crochet 1 treble in each of the next 20 stitches. Fasten off. Row 24: Join a new colour, chain 3, turn your work and crochet 1 treble in each of the next 19 stitches. Now Crochet 10 trebles over the row of chains from the previous row, 1 treble in each of the next 5 stitches. Fasten off. Row 25 - 44: Join a new colour, chain 3, turn your work and crochet 1 treble in each stitch to the end of the row (35 stitches a row). Fasten off at the end of each row. Repeat this 19 times. That is the body of the tea cosy made. You should now be able to wrap your work around the teapot with the ends meeting nicely at the handle. Sew the handle edge up leaving a gap that is slightly bigger than you need for the handle, to make it easy to get on and off. I sewed together the bottom 5 stitches and the top 10 stitches on my tea cosy. With a long length of yarn and a darning needle, weave this yarn through each row of the tea cosy at the very top so that when you pull the ends of this yarn together tightly the top of the tea cosy gathers together. Sew these ends of yarn into the reverse of the tea cosy to hold them in place. Make a magic ring, *chain 4, slip stitch into the ring* repeat this 5 times. Pull the ends of the ring to tighten it up and sew the ends in to the reverse of the flower to hold them in place. Sew a contrasting colour from the middle of each petal into the middle of the flower and then sew the flower onto the tea cosy. 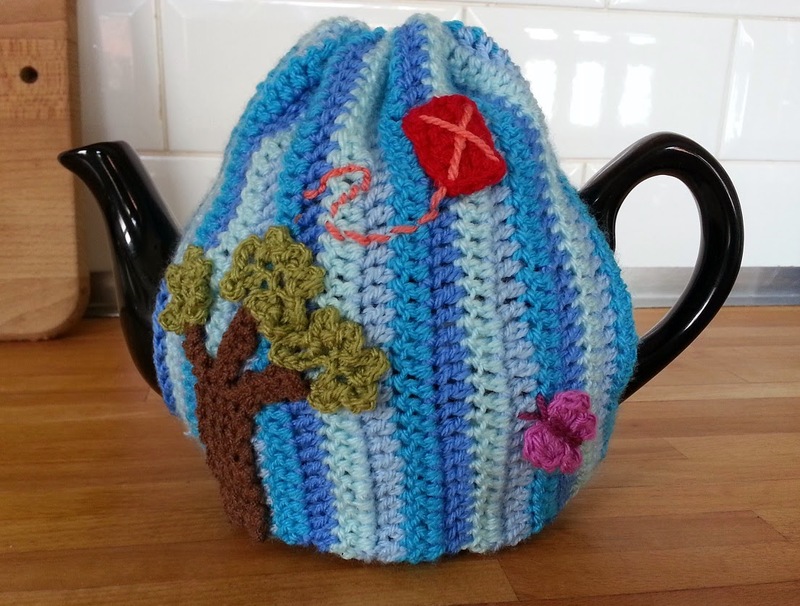 Edit: this is the same pattern I have used for my Summer Sky Tea Cosy; if anyone would like the patterns for the kite, butterfly and tree please let me know!